UPDATE: Celebrating Canada’s 150th Anniversary. The name Missing Chapters speaks to the under-representation Asian Canadians’ contributions to the public Canadian history, public discourse and consciousness. The project gives voice to individuals whose stories have not been heard broadly or reflected in the Canadian history and social fabric, and which we believe need to be shared with a larger audience. The goal is to assemble a unique Pan-Asian collection of authentic and inspiring stories of participation and contribution, struggles, perseverance and resistance, identity and belonging, settlement and integration, social inclusion, community development and collaboration, as well as showcase the achievements of Asian Canadians in Calgary. 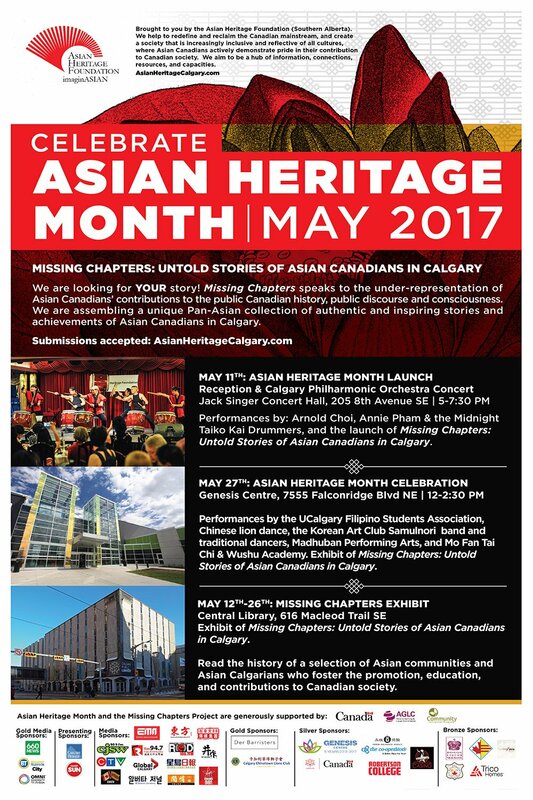 AHF will launch the project during Asian Heritage Month in May 2017 at various venues such as the Jack Singer Concert Hall, Calgary Public Library branches, and the Genesis Centre. Stories submitted by March 31 that are selected would be showcased in May for Asian Heritage Month.